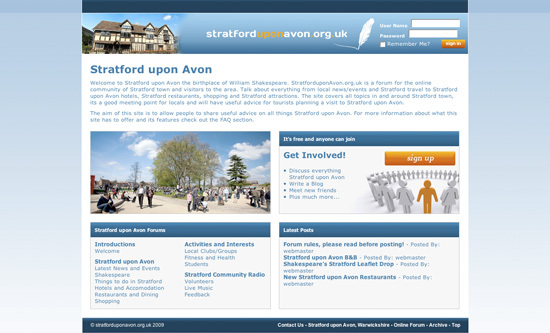 www.stratforduponavon.org.uk is a new online forum for visitors to Stratford upon Avon and the local community of Warwickshire. It's free to join the website and a useful place to network with like minded people and businesses in Stratford upon Avon. The site covers all topics in and around Stratford town and will have useful advice for tourists planning a visit to Stratford upon Avon. The Stratford upon Avon Forum will contain everything from local news/events to Stratford upon Avon hotels, Stratford restaurants, shopping and Stratford attractions. The aim of this site is to allow people to share useful advice on all things Stratford upon Avon.